The first time I ate at Marea, I could not stop thinking about when my next meal there would be. I had only been for lunch, but what an impression it made on me. For the next 6 months, I repeatedly dropped hint after hint to all my friends about a possible outing, but to no avail. However, I recently got the chance when a friend visited and seemed just as excited as I was after hearing so much about it. It seemed only logical to follow up one Michael White restaurant (Ai Fiori) with yet another, not to mention both within the same week. Marea offers an a la carte menu, a four-course prix fixe, and tasting menus of 6 and 8 courses. Of course, we decided to pull out all the stops and go all out on this particular night. If you’re only in NYC once a year, you almost have to get the 8-course chef’s tasting menu WITH wine pairings. There are things in life you look back on and regret doing, and then there are things you look back on and regret not doing. This would be one of those things you’d regret not doing. We were able to secure a last minute, day-of, reservation at 8:45pm on Sunday evening. I sat in the main dining room on my first visit, but this time we were led to a smaller area just past the end of the bar. The main dining room has a much fancier feel to it, while the separate bar area has a more casual feel to it. I’m actually glad we were seated in the more casual area because I did not want to disturb the other diners with our conversations and laughter, which got increasingly louder as the night progressed and more wine was consumed. To tickle our appetites, we chose to go with their housemade olive focaccia bread. Sadly, not many places put enough effort into their bread, but it really shows when you do. The focaccia was one of the best that I’ve had; it was soft, chewy, salty, and full of flavor. Our amuse bouche was a piece of fresh crudo and caviar. The presentation was lovely and bursting with vibrant colors. With this one bite, I knew the meal we were about to eat was going to be something special. The next bite I had almost made me want to cry it was so good. A rich yet immensely tasty sea urchin, lardo, and sea salt combination set atop a lighted toasted piece of bread just melted in my mouth, perfectly complimented with a glass of champagne that wasn’t too dry. A trio of crudo consisting of mackerel and two others followed as part one of our first course (I believe wahoo was one, but I’m not sure of the last). The mackerel was very fresh and did not have the typical strong fishy taste to it. The second piece was excellent with a slight hint of chili oil, parsley, and fruit notes from the apple. Lastly, the third piece was a bit chewier and was topped with some lemon to give it a citrusy zest. Part two of our first course was a plate of very refreshing oysters. The dish included 2 sauces, one shallot and one vinegar. The shallot sauce had good shallot flavor, yet was light enough that it did not distract from the true taste of the oysters. This dish was paired well with a dry white wine. The course that followed was amberjack atop some fennel with pine nut cream and a side of chanterelles paired with a buttery white wine. The fish was firm and juicy, and with all the vegetables together, the dish as a whole was on the lighter side. Nothing was bad about this dish, but nothing about it was amazing either. It was probably my least memorable dish of the night, and only because everything else was so good…sigh. The crispy frog leg and slow poached egg dish that greeted us next was something special indeed. I never had an egg so fresh and so poached perfectly that the yolk just oozed out almost in slow motion as I broke its soft casing. It was the best poached egg that I’ve ever had. The frog leg was seasoned well and had just the right amount of coating on it while the inside was still moist and tender. This dish was paired with a sweeter white wine. Knowing Michael White and his pasta reputation, I was excited to try whatever pastas were placed in front us. And despite my lofty expectations, I was not disappointed. The light and fluffy gnochetti with ruby shrimp had just the right subtle hint of chilies in the sauce. Additionally, the gnochetti still had a bit of chewiness to it that added more to the texture. This was paired with a red wine (sorry, I started losing track of the characteristics of the wine at this dish). I was excited that our next dish was the famous fusilli with octopus braised in red wine and bone marrow. Just as rich and decadent as it was the first time I had it, this pasta is not some run-of-the-mill creation. Each component can stand alone and hold its own, but together, they form a dish that exemplifies a chef’s creativity and dedication to deliciousness. 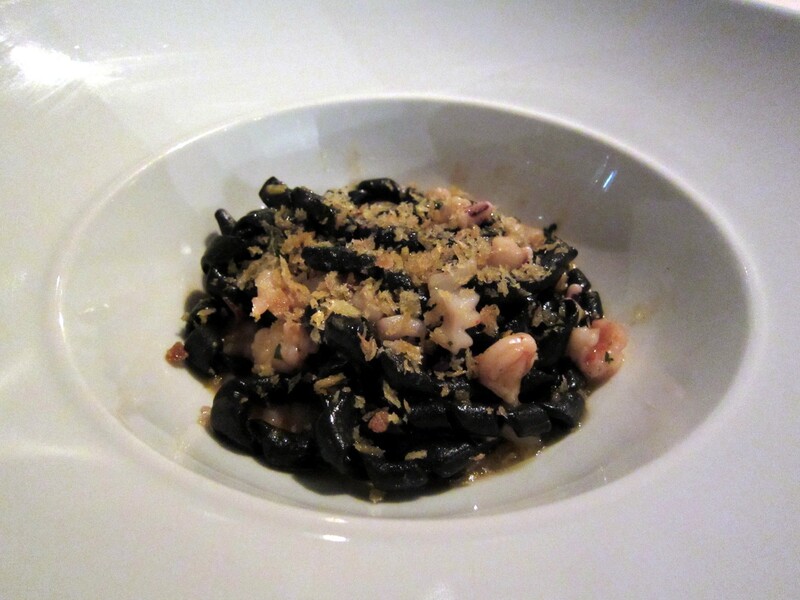 Of course, the pasta was cooked perfectly, the octopus was tender and flavorful, and who doesn’t like bone marrow? Seriously. Finally, the bread crumbs sprinkled on top were just the ‘icing’ this dish needed. No surprise that this dish was paired with a red wine. Talking about extremes, we come to the dry aged steak. According to the menu, Marea’s bistecca is dry aged 50 days. It’s worth noting that most of the best steakhouses don’t even age their beef half that long! Each piece of my medium-rare steak was tender and full with flavor. To add onto the ridiculousness, there was even bone marrow on the very same plate. Everything on the plate was so delicious that I stuffed my face even though I was starting to reach my stomach capacity. The only slightly negative comment for this dish was that my friend’s steaks were more on the medium side, while mine were a perfect medium-rare. This dish was paired with an absolutely delicious full-bodied complex red wine with a very nice finish (I remember because it was so good). To cap off our memorable night, we were presented with a trio of desserts. Directly facing us was a soft carrot sponge with good carrot flavor. The carrot ginger sorbet on top of the mascapone had a very nice hint of carrot that wasn’t overpowering. But the coolest part of this dessert by far, was the crisp carrot twist, even this had carrot flavor that you could taste, not to mention the incredible crispy texture that it added to the dish. Another reason Marea holds a special place in my heart is because of their bomboloni. I was never much of the dessert person, but after trying them on my first visit, I could not keep these lightly fried, sugar-coated doughnuts out of my dreams. They have a great crispy texture on the outside with a soft, warm, and moist inside. Because they are not too sweet, they go very well with the dark chocolate and espresso gelato. And to top it off, an espresso crumble adds yet another dimension of texture and flavor to an already amazing dish. The last dessert was good too, but not nearly as memorable as the others so I won’t go into it. Located on the second floor of the Setai Hotel on Fifth Ave, the Michelin-starred Ai Fiori sits at the top of a polished marble spiral staircase. As you reach the top, there’s a nice bar and lounge area with a modern feel to it. The hardwood-floored dining room is quiet and spacious, with windows stretched across one side overlooking the street. In terms of noise level, it’s nice to actually have a conversation with everyone at your table and not be disturbed by the ramblings of other patrons or waiters walking by, something not too common in New York City. Speaking of waiters, service was top-notch the entire evening. This has the potential to be the standard to which I start comparing all other restaurants to. Our waitress was very knowledgeable regarding the menu and was able to give recommendations according to our personal preferences. It felt like she genuinely cared and wanted us to have a great time. We did not give the sommelier an easy job either, but he was able to pick out a decent Pinot Noir to pair with our fish and lamb within our given price range. Glasses were never empty throughout the meal, whether it be water or wine. But the real “cherry on top” was when one of our friends had to leave before our meal was actually over. Not only was she able to pay early for her portion of the bill, our waitress even sent her dessert back into the kitchen so they could pack it up to go. If that’s not good service, then I don’t know what is. Now, onto the crux of it all. We decided to forego the tasting menu and just stick with the prix fixe. To start off, our amuse bouche was a chilled fennel soup served in a shot glass with tiny balls of lemon gelatin. The lemon added a nice citrus note to the soup, which had good fennel flavor to it. For the first course, I ordered the sweetbreads; and to be honest, I had mixed feelings about the dish. My initial thought after the first bite was of popcorn chicken since the coating was on the hard and slightly thicker side. The proportion of coating to sweetbreads in that first bite was not very flattering. 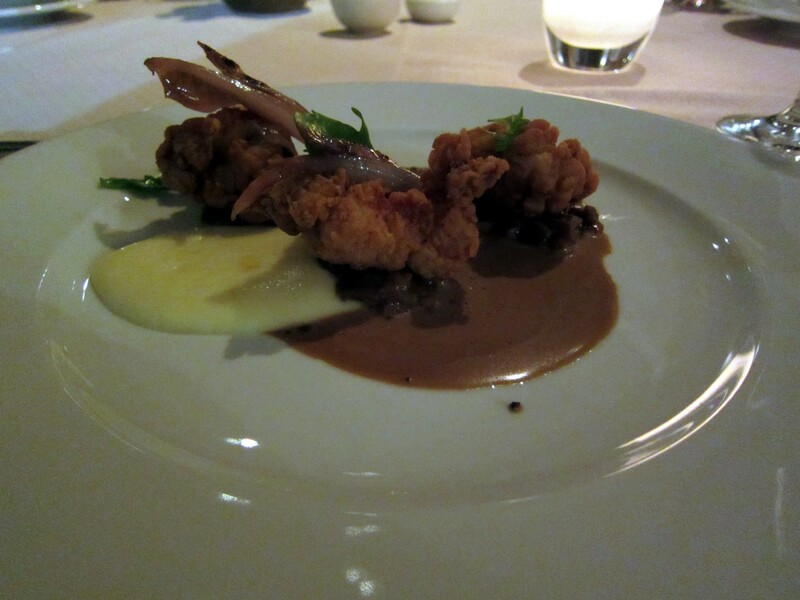 But as I ate on, the sweetbreads had a soft and tender texture that went well with the pancetta and truffle sauce. I think more truffle flavor (and less coating) could have elevated the dish, so even though it wasn’t bad, I’ve had better as far as sweetbreads go. The crudo looked fantastic when it was set down, portion size was good and all the pieces were topped with sturgeon caviar. The saltiness of the caviar was nice with the fish, but I wished the fish was more melt-in-your-mouth. My favorite of our first courses, however, was the lobster soup. A buttery and creamy soup with hints of black truffle and immense lobster flavor were poured over fresh chunks of lobster. I could drink that all day. The traditional second course of pasta or risotto followed, but Michael White’s pastas taste like nothing traditional. The Trofie Nero pasta was simply delicious in every way. Perfectly al dente and slightly chewy, each bite of pasta and seafood had an added texture with the breadcrumbs sprinkled on top. Unfortunately, I made the mistake of not ordering a pasta at a Michael White restaurant and decided to mix things up with the risotto. Never again. 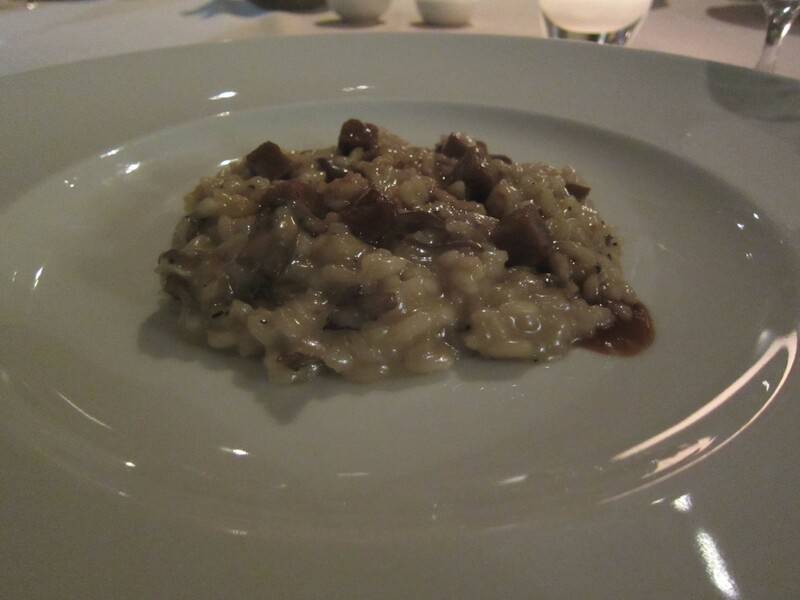 The risotto was way too salty and slightly overcooked in consistency. A very prominent sage aroma went well with the duck and mushrooms, but the dish just could not be rescued. 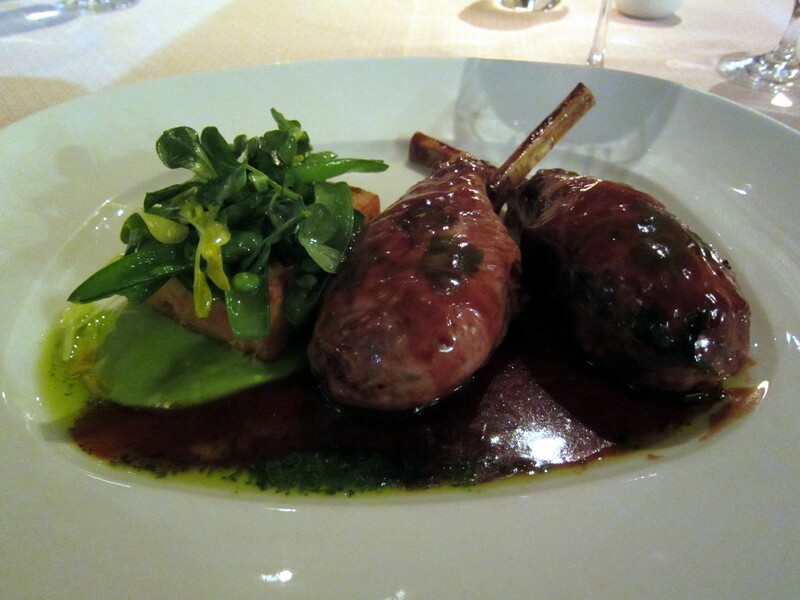 When my third course arrived, I had to fight the urge to pick up the two glorious racks of lamb, one in each hand, and devour the meat from the bones with my teeth. They were cooked to a nice medium rare and tender throughout. The dish had good flavor with the fresh peas and goat cheese panisse. My friend ordered a fish that was cooked well. The meat was firm, but a little flat in flavor so not really that impressive. The duck and foie gras dish was tasty, but sadly inconsistent. Some parts were tender and juicy while others were tough. The friend who ordered the guinea hen really enjoyed it, so it must have been decent though I didn’t try it myself. Overall, as good as everything tasted, nothing was so spectacular that I’d go for a second serving of. Desserts were decent all around. The rum cake was tasty, yet not too sweet, with nice textures from all the components on the dish. Ai Fiori has some great courses here and there, just as long as you pick the right ones. The highs are very high, but the lows, well let’s just agree to stay clear from those. They also have an extensive wine list, focusing obviously more around Italian wines. Overall, with solid food and exceptional service, I would definitely return to try the rest of the menu, especially the pastas that eluded me this time around. Like almost all the other supposed hidden-gems in NYC…there will be a line to get in. On a Saturday afternoon at 2:30pm, we still waited half an hour. Expect to wait even longer during peak times and don’t be surprised if you can’t find seating because there are very few available. Not to nit-pick, but my friend and I felt that the meat lacked that extra oomph in flavor. The french fries, albeit fresh, also lacked the slightest sprinkle of salt. In terms of a solid, tasty, and well-cooked burger, Burger Joint ranks among the top fast-food burger spots in NYC and lives up to the hype. However, pound for pound, I’d still prefer to go with a good Shake Shack burger. Not to mention Burger Joint is cash only too. I’ll reiterate some of what I said from my previous visit and keep it simple. Burger Joint has the best consistently cooked meat out there in the category of fast food burgers. After a few tender and very juicy bites, you’ll wonder where your burger disappeared to. Answer: your belly. But once again, as good as the meat quality is, it still needs more flavor. That’s the only flaw in an otherwise perfect fast food burger. For my second visit, we came around 8pm on a Monday night. The not-too-ridiculous line moved quickly and our orders came out fast. We were lucky enough to secure a booth to enjoy our pitcher of beer and fries. When we were done scarfing down our meal, a low rumble told us our hunger had not subsided. Luckily, the line had dwindled down to just a couple deep. Unable to pass up the opportunity, we decided to go for round 2. 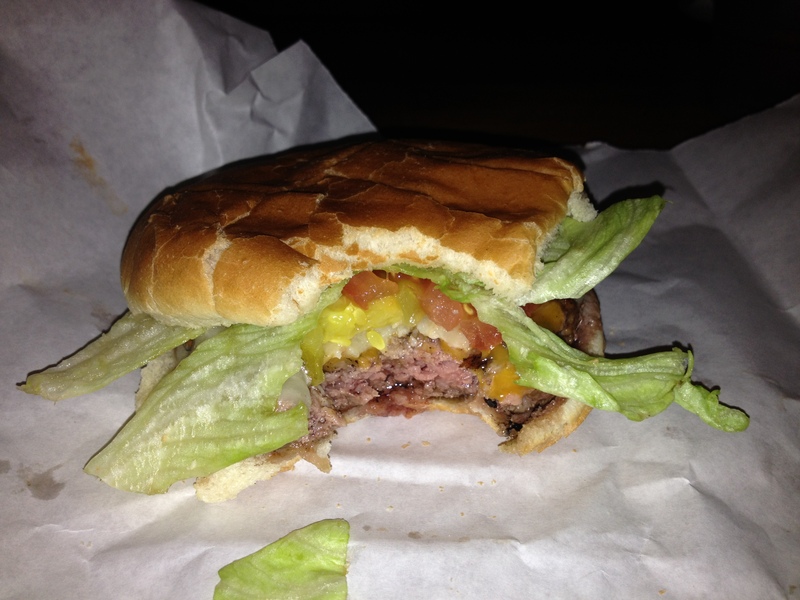 The medium rare cheeseburger was just as good and consistent as the previous ones, but the fries were not as fresh. Can’t have everything I guess. All in all, Burger Joint killed it again. If you’re in the mood for a solid italian option, go for Novita. Walk a few steps down and you’ll find the dining room behind a curtain. The restaurant is on the small side so expect to be cramped. Dimly lit in the evenings, it gives off a slightly romantic feel to the atmosphere. However, the noise level can get pretty energetic because of the small space, so I personally wouldn’t take a date here. We decided to skip the appetizers on this particular night and just dive right into the pastas. The tomato sauce for the orecchiete with spicy sausage and broccoli rabe was a new twist to the classic that worked well, adding a nice subtle spiciness that wasn’t overpowering. The pasta was cooked al dente, but the sausage was overcooked and a bit tough. From my small bites of the other pastas, they were all cooked well and had good flavors. I thought the tagliolini with lobster was quite colorful with the asparagus adding some nice earthy green to the dish. My friend who ordered the spaghetti with clams dish had a decent heap of tiny empty clam shells by the end. And my other friend thought the best pasta of the night was the pappardelle with lamb ragu. Dessert consisted of cheesecake, tiramisu, and chocolate tart. 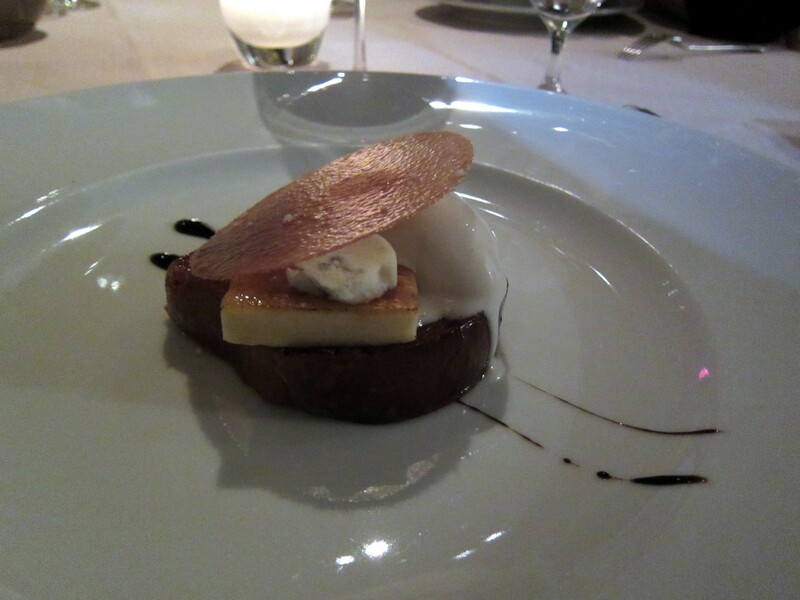 The chocolate tart was nothing special, but my oh my, the other two were simply delicious. Both the cheesecake and tiramisu were soft, creamy, and dreamy. Unfortunately, service throughout our meal was very slow. We had to flag down the waiter numerous times to order wine, entrees, dessert, and to refill our water. On the plus side though, their wine list has a good number of bottles under $100, so alcohol doesn’t have to break the bank. This was my second visit and I’ll be back, but I really wish they’d up their service.